This exquisite cross, which in the late-nineteenth century was in the possession of Fr Prendergast, the last abbot of Cong, Co. Mayo, was made c.1123, in Roscommon, probably for the diocescan centre of Tuam. The work is of the highest order: a core of oak, a large rock crystal, an elaborate mount and a flange decorated with gold filigree, niello (a deep-black mixture of metals) and blue and white glass studs. 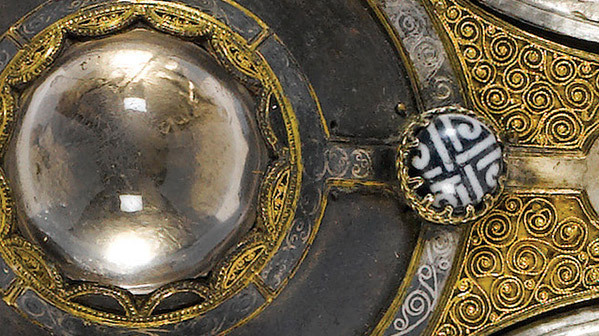 The cross chimes with other objects, such as the shrine of St Patrick’s Bell, the high crosses of Kilfenora and Dysert O’Dea and the sarcophagus at Cormac’s Chapel in Cashel, as expressions of a post-Viking Irish culture. All are heavily influenced by Hiberno-Norse design, in this case the so-called Urnes motifs (named after a site in Norway) of S-shaped animals interwoven with threadlike snakes. The cross is a typically eclectic object. The head of the beast that grips the base has been compared to German Romanesque models. At the same time, this is a culmination of a long tradition of Irish ecclesiastical metalwork. Dr Pat Wallace, former director of the National Museum, has described it as ‘both the last and one of the finest artistic efforts of our entire Early Christian period’. The cross’s significance, however, goes beyond its artistic beauty. It can be seen as a weapon in the endless struggle for overlordship in Ireland. This is not just a crucifix for church worship; it is a shrine designed for the public display in procession of the most prestigious of mediaeval relics: an alleged fragment of the True Cross on which Christ was crucified, originally contained behind the central crystal. The Cross of Cong is 76cm high, but in procession it was held even higher on a staff or pole. It was meant to invoke awe. The context for this is the vacuum in power that followed the Battle of Clontarf, which both curtailed the Vikings and ended the imperial ambitions of Brian Bóruma. The Irish annals mention cath Saxan, ‘the Battle of the English’—the Norman invasion of 1066 that would have momentous consequences for Ireland—but these noises off did not distract from the internal struggles for dominance. The Cross of Cong was commissioned by the king of Connacht, Toirrdelbach Ua Conchobair (Turlough O’Connor), who was attempting to establish himself as high king of Ireland. He mounted successful campaigns against Munster and Dublin. His overlordship was never uncontested, but it acquired a crucial claim to legitimacy when he was given a fragment of the True Cross, which may have been brought to Ireland in 1123 as a means of encouraging (with limited success) Irish participation in Pope Calixtus II’s crusade to the Holy Land. The Cross of Cong is thus a direct product of both international and Irish political machinations. Not even the power of the True Cross, however, was enough to establish Toirrdelbach as a secure, centralised monarch of Ireland. Irish politics remained Byzantine and often bloody, with no one dynasty able to exert national control. This created a situation wide open to exploitation by opportunists already well entrenched across the Irish Sea.